For our last day with the car, we wanted to visit the Golden Circle on our own. Sure, you can pack onto a tour bus. But when you have the option to travel on your own, why would you take a bus? Also, if you’re two or more people, you’ll save money on the trip by doing it with a car. After breakfast, we slipped quietly out of Reykjavik at the height of rush hour. Despite my dumb mistake of taking a wrong turn (twice), getting out of Reykjavik was absolutely painless. Our first stop was in the suburb of Mosfellsbaer, which hosts the Alafoss Wool Outlet. As Laura was shopping, I watched as a parade of older Icelandic women entered the shop, each carrying a plastic bag or two filled with wool sweaters. They were coming in and selling their handknit creations to the store. You can hear a store talk about their sweaters being handknit, but seeing the creators coming into the store really brought it to life. 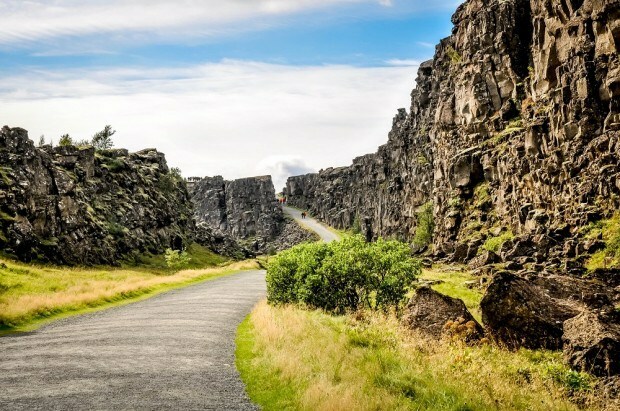 We cut across Route 36 over towards Pingvellir/Thingvellir National Park. 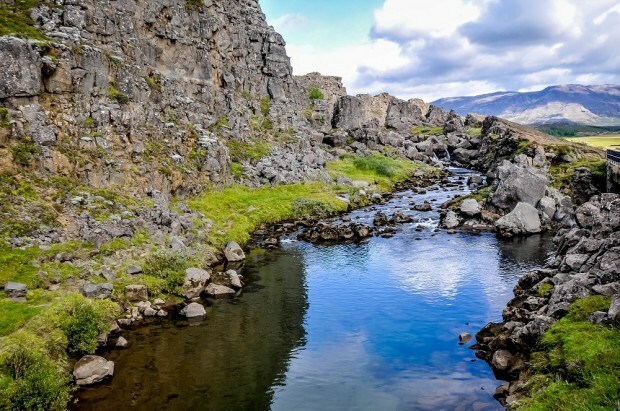 This UNESCO World Heritage Site is both an amazing geological formation and an important part of Icelandic history. Thingvellir is a rift valley between the North American and Eurasian tectonic plates – you can actually walk down into the fissures of the rock. Historically, the site is important as it hosted the Parliamentary assembly of Iceland from 930 AD until 1798. For two weeks every summer, the Icelandic assembly met here in an event that was part festival, part governance meeting, part trial, and part flea market. After exploring the park, we drove on to the village of Laugarvatn for lunch, only to find the gas station closed. When in Iceland is the restaurant in a gas station closed? Oh the inhumanity of it! Instead, we opted for a small roadside café, where we had the traditional burgers with the orange paprika special sauce. 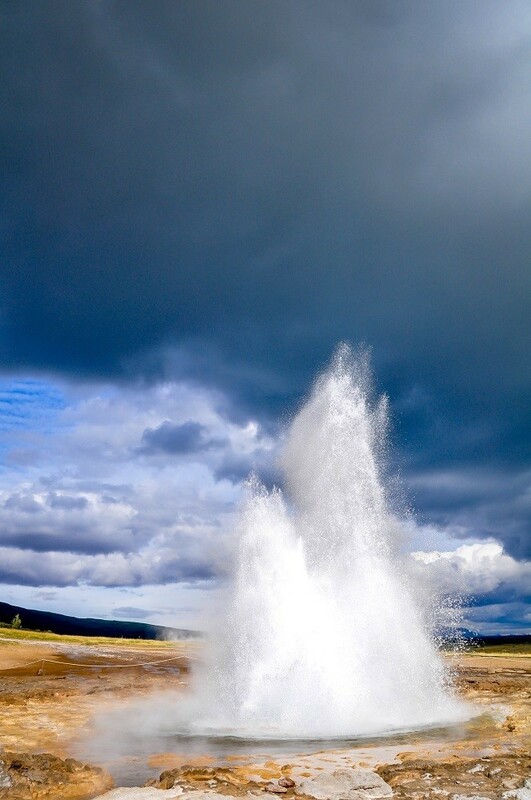 About a half hour up the road from Thingvellir National Park is the geyser Geysir. This is the original exploding hot water plum for which all others in the world are named. Unfortunately, idiotic tourists threw rocks into the original Geysir caldron, so it no longer erupts with significant regularity. Just another 10 minutes up the road from Geysir is the impressive waterfall of Gullfoss. 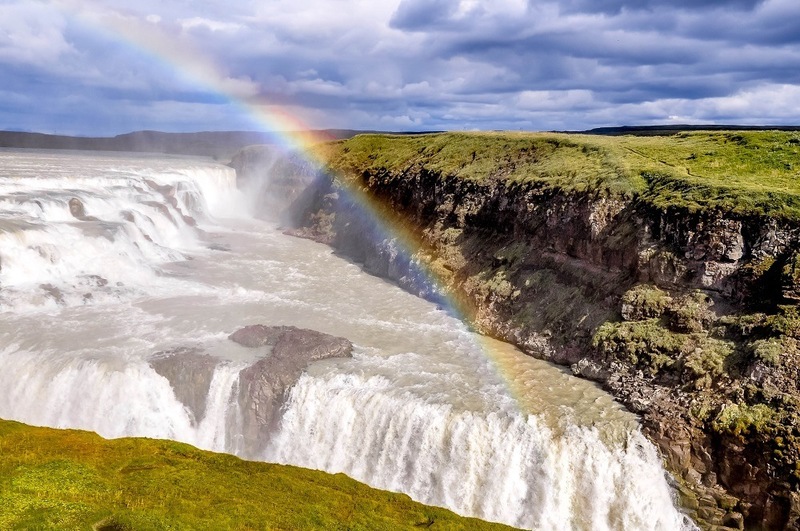 Gullfoss is one of the top tourist sites in Iceland – a credit to both its geographic proximity to the capital of Reykjavik as well as its natural beauty. The Gullfoss falls is a two-step staircase and then the river drops off into a deep crevice and away from view. We were here on a very overcast day, however, we did have a couple of breaks in the clouds where we were able to capture Gullfoss with the beautiful rainbow that can form over it. After the Golden Circle, we drove Route 35 back down to Route 1 and then back towards Reykjavik. Since it was a Friday, there was a spectacular parade of cars leaving the capital for the weekend. Our next goal was to get out to the famed Blue Lagoon. About this time, I made a really, really bad decision. I noticed on the map a Route 417 “shortcut.” The first part of the road (Route 407) was fine as it climbed its way up towards a ski resort, which was closed since were there in the summer. However, as Route 417 cut off to the right, the road became extremely rough. It was hitting large rocks and felt like I was dragging the bottom of the car along the road. This was a bad, bad move. The only redeeming feature of Route 417 is just as it approaches Route 41 near Hafnarfjordur. For about a mile, there are hundreds of wooden structures with fish drying in the sun on them. Yes, it smelled terrible, but was a very traditional Icelandic thing to see. It was late afternoon when we finally arrived at the Blue Lagoon. 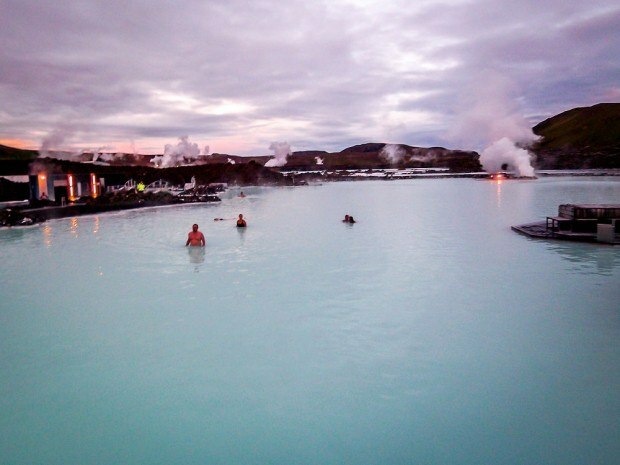 The Blue Lagoon is one of those absolutely iconic sights in the world. Whenever you tell people you are going to Iceland, they always ask about it. And for good reason– it was one of the absolute highlights of our trip to Iceland. For photographers, as you drive into the parking lot, there are a couple of blue pools outside the complex on the side of the road. 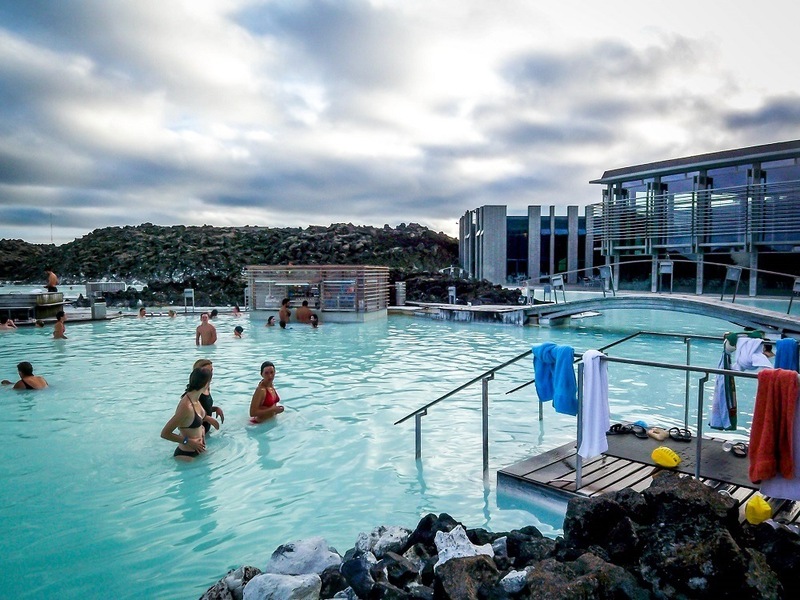 These are the “bluest” pools and make some of the best pictures. The Blue Lagoon complex is HUGE. When you arrive, the parking lot is a quarter mile walk from the entrance. Since we were there late, were able to park close. We entered and ate a quick sandwich in their café before going into the lagoon. The complex is pristinely clean and almost sterile. They issue you an electronic wristband which locks and unlocks your locker. Plus, you can order drinks at the bar in the lagoon and charge them to your wristband, paying for them later. It’s great not to have to run back inside to buy drinks or need to carry a credit card. The Blue Lagoon itself is wonderful! The water is the perfect temperature. It’s relaxing and therapeutic. The bottom is inconsistent and I stubbed my toes several times (Laura says it is because I’m a klutz), but watch out for submerged rocks and objects. The waterfall massage wall is the absolute highlight of the Blue Lagoon! After the stressful drive over Route 417, I spent what felt like forever under the waterfall wall being pummeled. 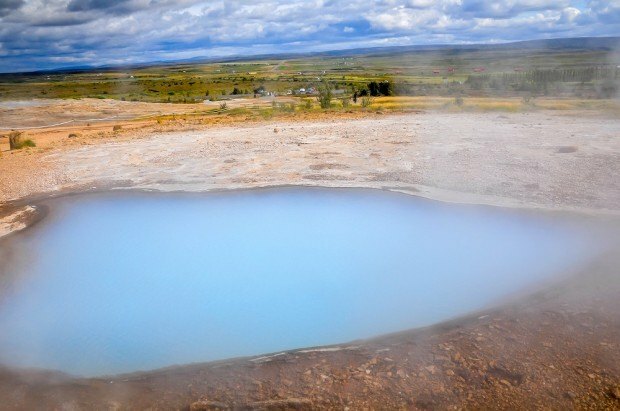 The Blue Lagoon is famed for its silica scrub. At several places along the wall, there are wooden boxes with slits and then buckets inside. The buckets are filled with pounds and pounds of silica that you cake onto your body like a mask. It’s supposed to make your skin silky soft. We caked our faces, necks, shoulders, etc. in the silica scrub and just loved it. We also helped ourselves to two of the “Blue Lagoon” cocktails from the bar – they were very pleasant, although a bit weak in terms of alcohol content. After our time at the Blue Lagoon, we needed to get back to the Keflavik airport and return our rental car to Hertz . It was fairly late and the gas stations in Keflavik were closed. We started to get into a panic about where we would refill the tank (again, how could we be in the one part of Iceland without an open gas station). We did find a small, automated one-pump gas station right at the airport complex (look for the Service Plaza as you come into the airport). The Hertz return office was closed, so we needed to do it right at the terminal. To get us back from the Keflavik airport to Reykjavik, we opted for the FlyBus. Let me just say, a discussion of the FlyBus (operated by Reykjavik Excursions company) deserves its own upcoming blog entry – The Reykjavik FlyBus Fiasco. We didn’t end up getting back to the CenterHotel Klopp until almost midnight and went straight to bed. Are you planning to go to the Golden Circle — what are you looking forward to most? If you’ve already been, what was your favorite part? 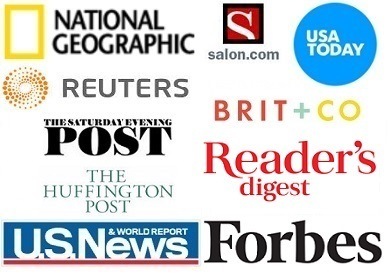 Some links on this site may be affiliate links, all at no additional cost to you. What do you think about The Golden Circle and Blue Lagoon, Iceland? Thanks so much for posting your helpful insights and experiences about your trip to Iceland. I’m planning a trip there and have been at a loss on the rental car return process. I have a 7:40 a.m. flight on my departure date, and wanted to know if it is possible to return cars and directly go to Keflavik. Any tips or suggestions about where to look for answers? The rental car places at Keflavik seem to be staffed rather continulously. We had no problem returning the car late in the day. As for an early departure, I can almost guarantee no issue – that’s the exact time flights from the USA arrive, so the rental desk should be well staffed. This is great information. Thank you! Can you tell me how long the golden circle drive took you? We are hoping to make it to a glacier walk on the south side of the island at 3:30 and I am wondering if the golden circle is doable in 5 hours leaving from Reykjavik. Thanks! I think it will depend on where on the Golden Circle you’re at. 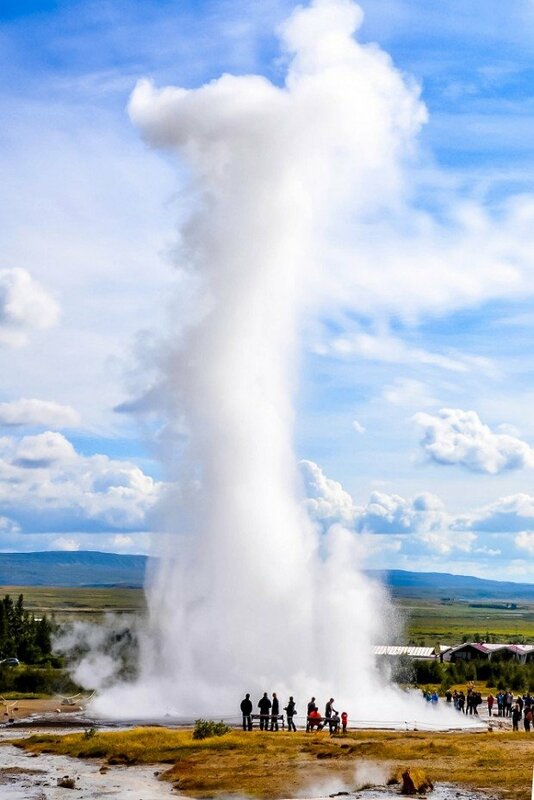 Up near Geysir, it would be impossible, but near Park might be possible. We spent a whole day during the Golden Circle. This was so helpful. 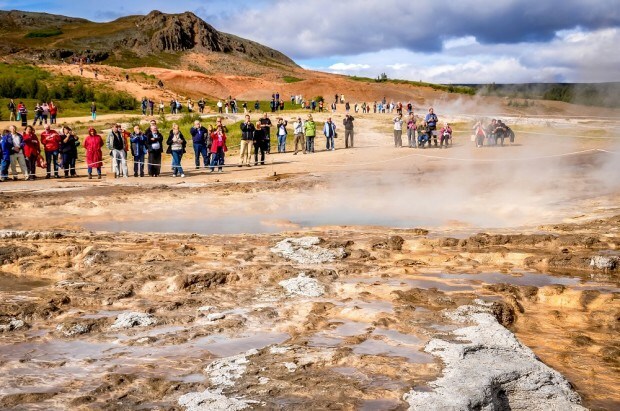 We’re planning on driving the Golden Circle tommorrow and then to the Blue Lagoon the next day. Luckily no Flybus involved. 🙂 Thank you for posting your experience, it was helpful and entertaining. This is such a helpful blog! We are looking at going to Iceland in November and would like to drive the Golden Circle and to the Blue Lagoon. What was it like to drive around the Golden Circle/Reykjavik? Thanks!! Driving the Golden Circle was fairly easy — more traffic than the rest of Iceland, but that was to be expected. We didn’t really drive around in Reykjavik. Have fun on your trip! Thanks for a helpful post! 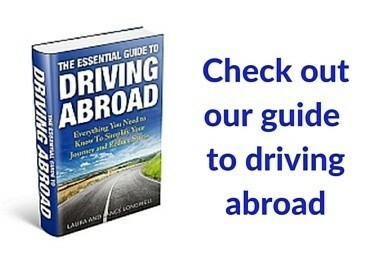 Great information for my upcoming trip. Thanks for this great information. We’re leaving for Iceland in a week and this has given us the courage to do the GC on our own. Can’t wait! We really enjoyed reading this. Me and my wife have just booked a trip to Iceland and we can’t wait. We’re slightly worried about the cost of travelling there, but it looks amazing! Your photos of the blue lagoon look epic!